We already posted an article about U.S. cities that are predicted to go underwater because of climate change but not about cities that are already at the tipping point of experiencing at least nuisance-level flooding at an accelerated rate. Accelerated flooding is already mostly noted along the Gulf Coast and East Cost of the United States. These means that the rate of flooding is not just increasing but that it is also accelerating. Particularly noteworthy is what is known as sunny day flooding, times when streets flood and there is no big storm to account for it, just high tide. The tipping point has been described as nuisance flooding at least 30 days out of the year. 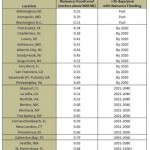 The main point from the chart displayed below is that Wilmington, NC, Washington, DC, and Annapolis, MD. are already past the tipping point. At least a half dozen more major cities are expected to reach it by 2020 and dozens more in the next few decades after that. Nuisance flooding is defined as sea levels of about one to two feet over typical high tides, and these floods tend to impact city streets of areas that are no more than a couple of feet over sea level. The problem is that this used to be rare or caused by large weather events, and it is not becoming common. In other words, the ecology of coastal areas in the United States and all around the globe has already reached a tipping point or a new equilibrium, but there is no way to provide assurance that the situation won’t get worse. Because of accelerated rates of minor flooding, it would probably be prudent to expect that it will get worse. These conclusions were drawn from measurements taken over 100 years. The reason that Miami, currently experiencing plenty of sunny day flooding, was not included is because the measurement point was moved after Hurricane Andrew, so 100 years of consistent data is not available. Rates are different at different spots along U.S. coastlines. The scientists remind us that the ocean is not flat and level like a bathtub. Currently, in the U.S., The Gulf of Mexico and the Atlantic cities are experiencing worse rates of accelerated flooding than is getting experienced along the Pacific. Impacts from recurrent coastal flooding include overwhelmed storm water drainage capacity at high tide, frequent road closures, and general deterioration and corrosion of infrastructure not designed to withstand frequent inundation or saltwater exposure. As sea levels continue to rise and with an anticipated acceleration in the rate of rise from ocean warming and land ice melt, concern exists as to when more substantive impacts from tidal flooding of greater frequency and duration will regularly occur. Information quantifying these occurrences and the associated frequency-based tipping points is critical for assisting decision makers who are responsible for the necessary mitigation and adaptation efforts in response to sea level rise. I'm on a mission to ride it out with you as the climate changes. 3.7 Million U.S. Residents Under Water: Is That Your House?